Many of you folks who are active on Twitter and Facebook know Shane Draper. He’s a great guy with a great sauce – and as you will learn… it’s all about balance for Shane and his Draper’s BBQ Sauce. I emailed him some questions… and here’s his answers. 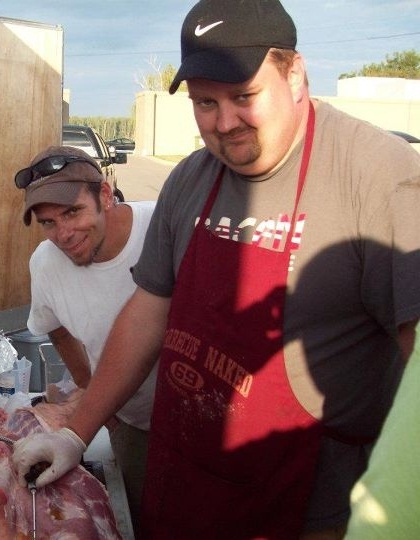 I am Shane Draper, I am the CEO and chief bbq dude / sauce creator for Draper’s BBQ. I spend the majority of my time day dreaming about different flavor combinations that pair with bbq to destroy people’s conceptions of great bbq is and how great it can be. When not doing that I am evangelizing against the overly sweet and unbalanced flavor profiles that have taken over the current bbq offerings. 2. Where are you from and where do you live today? I was born in a very small town in Western Kentucky and I live there currently. I have not lived here my entire life though. I did an 8yr tour in the Navy and a follow on 6 yr stint as a government contractor where I lived in Japan and also in the Virginia Beach, Virginia area. 3. When did you start making BBQ sauce? I’ve been playing with flavor combinations my whole life in various forms. I have always been able to take 5 random ingredients and dream up something. That show Chopped was built for me, lol. I didn’t really start working with bbq sauces until about 3yrs ago, but really seriously 2yrs ago. 4. Why did you start making BBQ sauce? There were a lot of reasons as to the why. Don’t get me wrong there are some great sauces out there but I never found “THE” sauce for me. I kept finding sauces were lacking balance and more times than not turned out more like flavored molasses, corn syrup or honey. Few of them had anything going on other than sweet, mixed with ketchup and some heat. I just wanted something that could take you on a roller coaster of tastes but yet was balanced. I wanted to be able to throw some curve balls at refined, well excised palates but still be accessible to the regular Joe. It took a lot of batches but I think I was able to do that with Smokin’ Sauce. Especially, when you mix Smokin’ Sauce with our A.P. Rub. Those two were built from inception to work together. 5. What is different about your business? What is different about your sauce? Hmm, different about my business, that’s a hard one. I think right now people are surprised how small of an operation we are. When they call the number on the website or business card I answer the phone. I do a lot of catering to competition teams dialing in specific flavor profiles to our sauces and rubs. I am just very, very hands on and protective of the Draper’s name. This whole thing started with my grandfather’s bbq restaurant in the 70’s and has culminated into me resurrecting the name and trying to take the name nation wide. As for what makes our sauce different, in a word balance. When you try Smokin’ Sauce you are lightly hit with the first sweet notes of molasses and a touch of honey. Next comes the bold and savory notes and you get some of the spices that I put in there that you normally don’t find in other sauces. Finally you are hit with just a touch of heat. It bites quickly and lets go and doesn’t linger. If you mix the A.P. Rub in with that taste of Smokin’ Sauce the saltiness of the rub tempers some of initial sweetness and the bold flavors are much more amplified. The spicy bite that hits on the backside is also a little stronger. All in all I wanted layered flavors in a sauce and rub combination that you could identify, but worked well together in a chorus, yet didn’t overshadow the meat and smoke that should be the star performer. 6. What has been the biggest success you’ve had so far? What is the biggest setback if any? This sauce venture has been a series of successes. Not everything we set out to do has turned out as planned, but it has always turned out positive. Our sauce took 6th place this year at Memphis in May and we have finished in the top 10 of nearly every sauce related contest we’ve entered, earned several 1st place people’s choice awards, we just got back from selling out of rub and almost all of our sauce at the American Royal and we’ve garnered a lot of critical acclaim for our sauce and rub over the course of the year. Of those it’s hard to say which the single biggest success is. I think they are all key to being where we are today. If I had to put my finger on a biggest set back it would be me being so busy that I have not released the next set of products to market. We have other sauces and a rub ready to go as soon as I get some down time to make it happen. For the first year in the “sauce and rub” business things are great. We have come a very long way in a very short amount of time. This is especially true when you consider how many amazing offerings there are from different small batch sauce producers. Just to be listed on the same page as some of them on sites like yours is an accomplishment in itself. We have been very careful though not to solely define our success during this first year just by number of bottles ordered or sold. For a new, unknown company it takes awhile to earn fans and convert those fans into repeat buyers who help drive your product. This first year has been much more about getting the word out about us and who we are than it was about putting dollars in the bank. All of that said we more than doubled the goal I set when we received our first sauce shipment in October of 2010. 8. What can people expect next year from you? I can only hope more of the same as far as quality goes. We have a couple of sauces ready for release this winter and I hope they get the same warm welcome that Smokin’ Sauce and A.P. Rub has gotten. I think the next line speaks to what the customers have been asking for. Where the Smokin’ Sauce was about balance and unexpected flavors the next sauce is my play on a honey bbq variety. It’s a fast ball down the middle so to speak but still has some complexity to be enjoyed. After that our “hot” sauce will come out. I keep getting asked for a hotter variety. While I personally am not the biggest fan of hot bbq sauces I will put this one out there and see what happens. If it sells it will stay in production, if not then perhaps we will keep it as a special one off run each year. I have a couple of rubs that are ready as well. One will be more of a beef / brisket rub and the other a more savory play on the A.P. Rub with it’s intention being more about bbq and less about being All Purpose. That’s a hard one for me. I love Japanese food after living there for 3yrs and I surely love Grandma’s home cooking and bbq like only my grandfather could do. My favorite overall meal with include something from each. Something like a plate of sushi, fried chicken, some ribs and a pork should sandwich lol. 10. How can people get to your site? Facebook page? 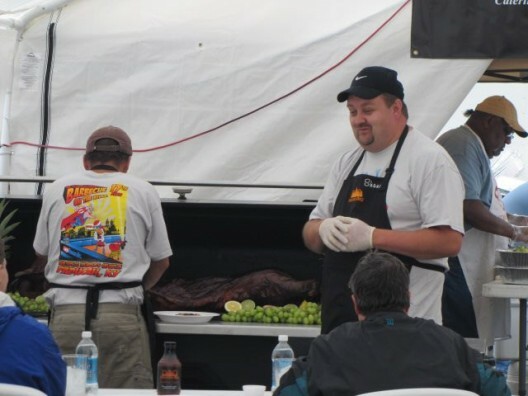 Our site is: www.drapersbbq.com – my good friend Mike Owings and I are working on building out the recipe section and the media sections. So check it out and of course check out our store to stay up to date on the latest sauce, rub and merchandise offerings. Of course people can follow/friend us on Facebook and Twitter. I am very, very hands on with fans and interact, respond to questions, give advice to competition teams using our products and have fun on both sites as much as my time allows. Love this Brian!!! I need to order some Draper’s BBQ Sauce soon! I have heard nothing but great things about his BBQ Sauce! Also Good Luck to Shane at the beer tasting at Roof Brothers this Saturday! Thanks for the opportunity Brian to be interviewed and being so gracious as to have this on your site! Cant wait to see what you have to say about our Smokin’ Sauce and some up coming offerings. Nice interview!! Enjoyed reading this one very much! Thanks Wayne, glad to hear you liked it… AND glad to hear you guys didn’t get busted for sneaking a little swig down at the Jack. 🙂 Can’t wait to join you guys for the next one.